Pongal is a specialty from the state of Tamil Nadu in South India. It is a delicious blend of rice and lentils, seasoned with peppercorn and spices in ghee. It has the nutty flavour of cashew and coconut, and though it is traditionally served at breakfast, it can be enjoyed at every mealtime. 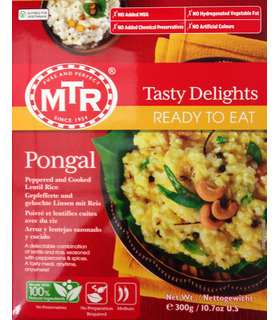 MTR’s packaging preserves the freshness and authentic flavour of Pongal. This filling and nutritious dish, is a complete meal on its own or can be served with MTR Sambar. 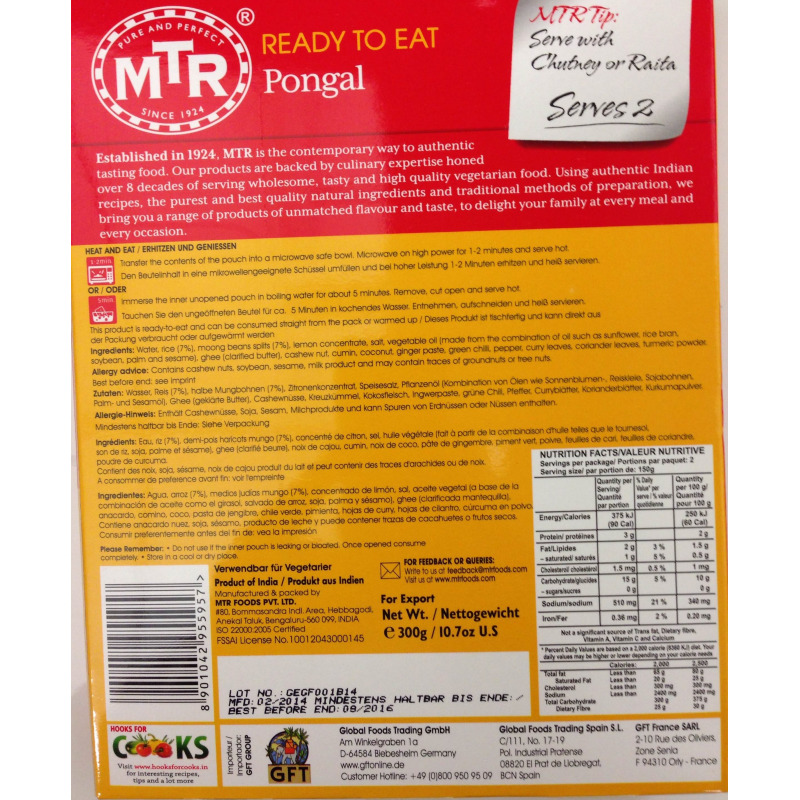 Spice level MTR’s Pongal is medium spicy. Preparation Immerse the inner unopened pouch in boiling water for about 5 minutes. Remove, cut open and serve hot. Or empty the contents in a bowl and microwave it for 1-2 minutes and serve hot. MTR’s Ready-To-Eats are natural, preservative-free and 100% vegetarian. You can read more about Pongal here . Pongal is a specialty from the state of Tamil Nadu in South India. It is a delicious blend of rice and lentils, seasoned with peppercorn and spices in ghee. It has the nutty flavour of cashew and coconut, and though it is traditionally served at breakfast, it can be enjoyed at every mealtime. 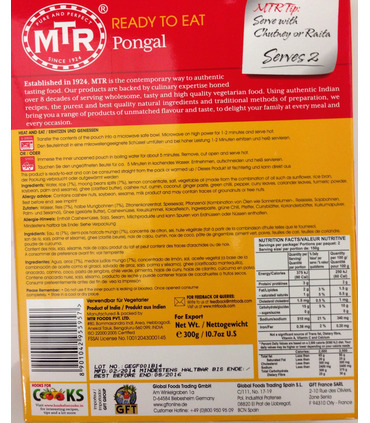 MTR’s packaging preserves the freshness and authentic flavour of Pongal. This filling and nutritious dish, is a complete meal on its own or can be served with MTR Sambar. 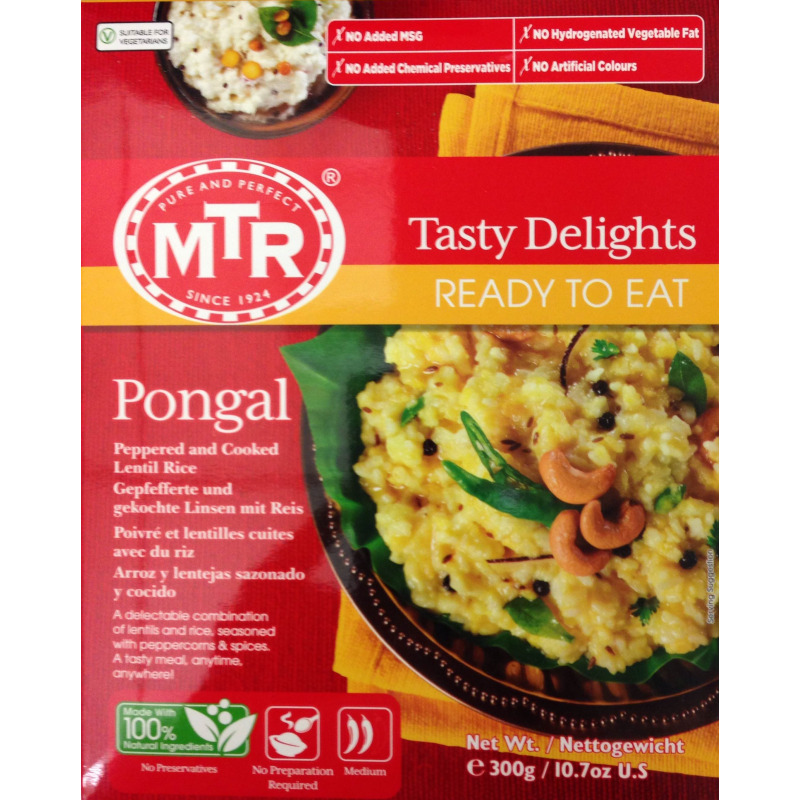 MTR’s Pongal is medium spicy. You can read more about Pongal here.